Get Great Pizza, Steak, Seafood, Soups & Salads! Falsetta's Casa Nova has been a Lansing tradition for 60 years, serving Lansing's first pizza in 1951. Now in our third location for the last 20 years and still using our old-world recipes along with a few modern ones. Enjoy casual dining with family and friends. Casa Nova has something for everyone! Although we are the first pizza place in town, Falsetta's has grown to be so much more than that! We now have something for even the pickiest eaters! With our wide array of soups and salads, burgers, sandwiches, our mouth-watering entrees include pasta dishes and our bourbon grill with the best steaks in town! Stop in for authentic Italian deserts and wine too! We make all of our sauces from scratch, insuring you get the freshest ingredients, every time. 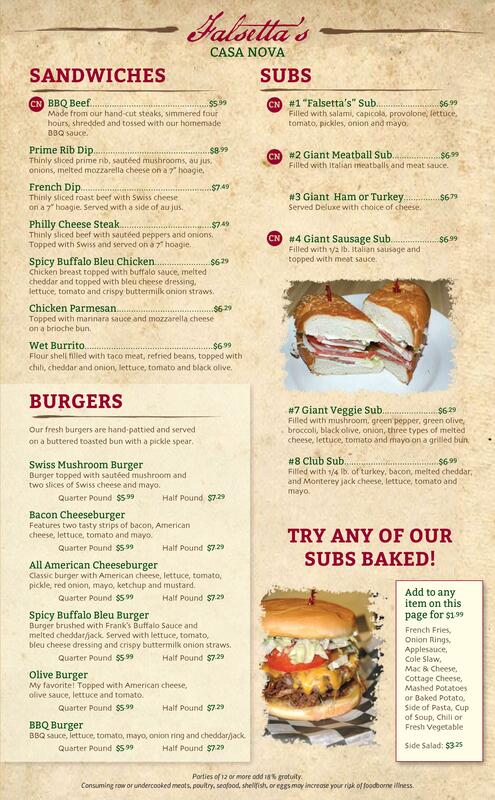 If your in the mood for home cooking but not in the mood to cook, Falsetta's has you covered! Check out our full dinner menu for the best Italian food Lansing has to offer. Contact us today or come visit us for for lunch and dinner to enjoy pizza, pasta dishes and other traditional Italian cuisine at our family restaurant today. We also offer delivery and take out! Call us today to learn more about how to get traditional Italian cuisine in the comfort of your own home! Copyright © 2019 Falsetta's Casa Nova, all rights reserved.